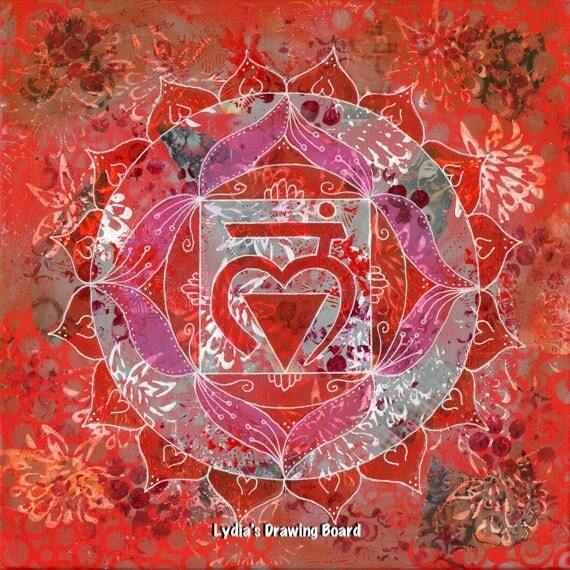 Lovely square notecard featuring a print of an original mixed media painting which is an interpretation of the first chakra. The size is 5 1/4" x 5 1/4", printed by the artist at her home studio on quality white matte notecard using an Epson Stylus Pro 3880 and archival inks. Comes with matching envelope. The watermark will not appear on the card. Signed and suitable for framing (includes a small white border). According to Wikipedia, "Muladhara (Sanskrit: मूलाधार, IAST: Mūlādhāra, English: "root support") or root chakra is symbolized by a lotus with four petals and the color red. This center is located at the base of the spine in the coccygeal region. It is said to relate to the gonads and the adrenal medulla, responsible for the fight-or-flight response when survival is under threat. The seed syllable is LAM.